The CPC Power Collet Chuck is the most popular model for CNC Lathepower workholding solution. The CPC Power Collet Chuck works withDIN6343 or C-44 type spring collets. Besieds O.D. chucking, CPC Collet Chuck (CPC-44) can be converted into I.D. 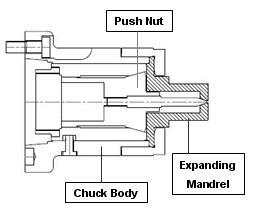 expanding chuck by installing a push nut and a expanding mandrel. Precision dead-length collet chuck: 0.025mm repeatability. Work with DIN6343 collets: 163E(B30), 173E(B42), 185E(B60), 193E(B80). Work with C-44 collet or C-44I expanding kit..
High speed up to 8000RPM (CPC-30). Large through hole up to 80mm (CPC-80). The CPC-44 Collet Chuck can also be converted to an I.D. expanding chuck by installing a pushing nut and an expanding mandrel. The conversion is very easy. Please inform JATO the dimension of the mandrel, or send us the drawing of your work-part. The mandrel will be quick shipped in 10 days.